The Wild Duck Cluster has an apparent magnitude of 6.3 and lies at a distance of 6,200 light years, or 1,900 parsecs from Earth. It covers an area of 14 arc minutes of apparent sky and is believed to be about 220 million years old. M11 is receding from us at 22 km/s. It has the designation NGC 6705 in the New General Catalogue. 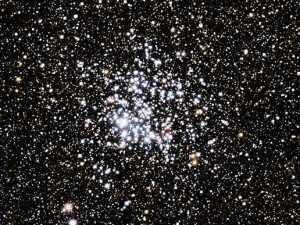 The Wild Duck Cluster is the most distant open cluster listed in the Messier catalogue that is visible to the naked eye. The cluster contains about 2,900 stars, which makes it one of the most populated open clusters known. It is also one of the most compact clusters and appears as a diamond-shaped patch in binoculars. The brighter members of the cluster form a V-shaped triangle that could be said to resemble a flock of ducks when observed in a small telescope, which is how M11 got its name. The Wide Field Imager on the MPG/ESO 2.2-metre telescope at ESO’s La Silla Observatory in Chile has taken this beautiful image, dappled with blue stars, of one of the most star-rich open clusters currently known — Messier 11, also known as NGC 6705 or the Wild Duck Cluster. Messier 11 is an open cluster, sometimes referred to as a galactic cluster, located around 6000 light-years away in the constellation of Scutum (The Shield). It was first discovered by German astronomer Gottfried Kirch in 1681 at the Berlin Observatory, appearing as nothing more than a fuzzy blob through the telescope. It wasn’t until 1733 that the blob was first resolved into separate stars by the Reverend William Derham in England, and Charles Messier added it to his famous catalogue in 1764. Messier was a comet hunter and the catalogue came into being as he was frustrated by constantly observing fixed, diffuse objects that looked like comets (for example, objects that we now know to be clusters, galaxies and nebulae). He wanted a record in order to avoid accidentally observing them again and confusing them with possible new comets. This particular stellar cluster was noted down as the eleventh such object — hence the name of Messier 11. 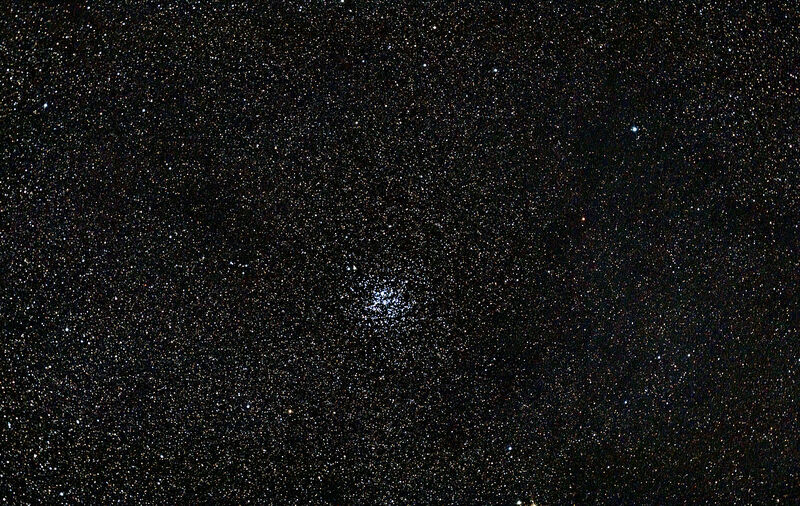 About 500 of the stars in M11 are brighter than magnitude 14. The brightest, hottest main sequence stars in the cluster have the spectral classification of B8, giving an estimated age of 220 million years for M11. 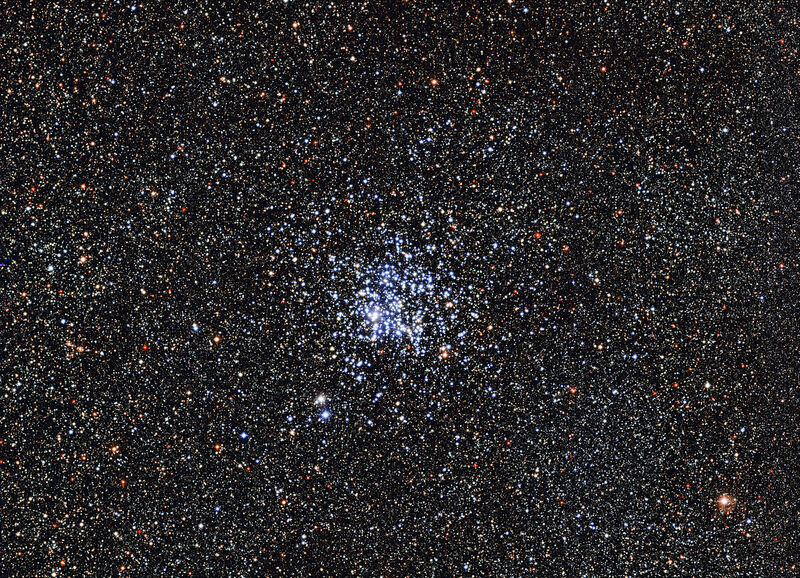 The cluster also contains a significant number of red and yellow giants. The stars in the cluster are only loosely bound to one another and M11 will disperse in a few million years, as its members are ejected one by one as a result of the cluster being affected by gravity from other celestial objects in the vicinity. The brightest star in M11, designated HD 174512 (HIP 92507), is a white bright giant with an apparent magnitude of 8.47. The star has the stellar classification A0 II/III and is part of a multiple star system. Messier 11 contains 82 variable stars, many of which are pulsating variables and eclipsing binary stars. Messier 11 was discovered by the German astronomer Gottfried Kirch, director of the Berlin Observatory, in 1681. In the night of May 30 to 31, 1764, I have discovered, near the star Kappa of Antinous, a cluster of a large number of small stars which one perceives with good instruments; I have employed for this a Gregorian telescope which magnifies 104 times. When one examines it with an ordinary [non-chromatic] refractor of 3 & a half feet [FL], this star cluster resembles a comet; the center is brilliant, there is among the small stars one star of eighth magnitude; two other, one of the nineth & one of the tenth: this cluster is intermixed with a faint light, & its diameter is about 4 minutes of arc. I have determined its position in right ascension as 279d 35′ 43″, & its declination of 6d 31′ 1″ south. A splendid cluster of stars, closely to the east-south-east of the above described object [a binary star]; it precedes the left foot of Antinous, and is on the dexter chief of Sobieski’s shield [Scutum]. This object, which somewhat resembles a flight of wild ducks in shape, is a gathering of minute stars, with a prominent 8th-magnitude in the middle, and two following; but by all analogy these are decidedly between us and the cluster. This, however, was not the opinion of Kirch, its discoverer, who, in 1681, described it as a small obscure spot, with a star shining through, and rendering it more luminous. Dr. Derham first resolved it into stars, with his 8-foot reflector, as shown in the Philosophical Transactions for 1733: “it is not,” said he, “a nebulose, but a cluster of stars, somewhat like that which is in the Milky Way.” That in the Milky Way! This fine object is on the shield by which Hevelius intended, FOR EVER, to honor John III., king of Poland. In the Prodomus Astronomiae, he appears to be uncommonly elated on having raised it to perpetual memory of the glorious liberator of Vienna – “ob immensa ejus merita, heroicas animi dotes, magnanimitatem, et ob res strenuè, ac fortiter gestas.” He was delighted in being able to place it in the happiest part of the firmament, where all the members and neighbors are significant. “I wish to know, benevolant reader,” he says, “that this shield consists of lucid stars, partly of the fourth magnitude; four of htese are placed in the border of this shield, and designate the princes of our serene king, who at that time were all among the living. In the middle of the shield I have designed a cross, in eternal remembrance of the battles most happily fought by him for the Christian faith: three notable stars shine in this cross, of which one indicates his own royal person, another the queen’s, and a third the princess’s, his only daughter; so that these seven stars represent the whole reighning family.” This, and much more, shows his anxiety and hope of its eternal duration; but, poor fellow, Mr. Baily has taken the field, and Sobieski is one of the first among the asterisms recently doomed to proscription. I hope his pruning-knife is to be applied to many other interlopers, most of whom are far more pretty than this. 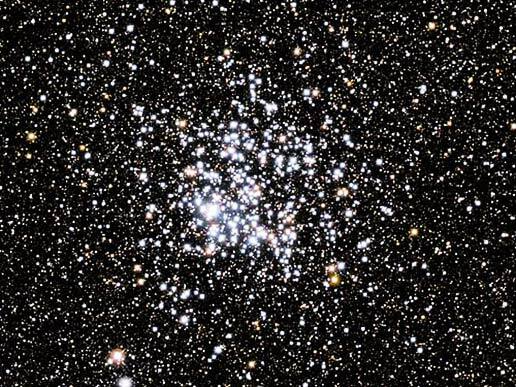 Swiss-American astronomer Robert Julius Trumpler classified M11 as Trumpler II.2.r, which means that the cluster is detached with little central concentration (II), has a moderate brightness range (2), and is richly populated (r). More recently, M11 has also been classified as Trumpler I.2.r, a detached cluster with strong central concentration. The Wild Duck Cluster lies close to the northern part of the Scutum Cloud, a large star cloud that marks one of the brightest sections of the Milky Way. Messier 11 lies about a degree to the northwest of R Scuti, one of the first variable stars known. R Scuti was discovered by the English astronomer Edward Pigott in 1795 and is the first known RV Tauri type variable. The star’s brightness usually varies between magnitude 4.8 and 6, and occasionally between magnitude 4.5 and 8.2. 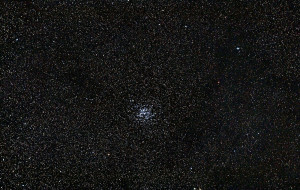 Messier 11 can be seen without binoculars and appears as a faint patch of light above the southern horizon for observers in the northern hemisphere. The cluster can be seen above the Teapot asterism in Sagittarius constellation. It can be located by first finding the bright Altair in the constellation Aquila, then following the line to the southwest to Denebokab, Delta Aquilae, and finally to Lambda Aquilae. Altair, the 12th brightest star in the night sky, is the second brightest star in the Summer Triangle, a prominent asterism high overhead in the summer, formed by Altair and the bright stars Vega in the constellation Lyra and Deneb in Cygnus. Altair marks the southern corner of the triangle. 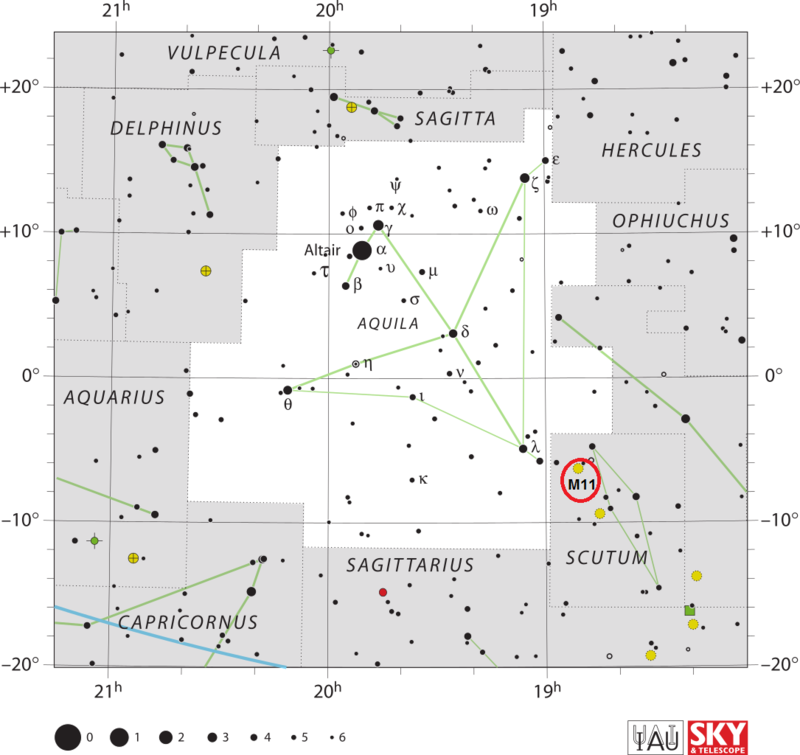 To the southwest of Lambda Aquilae lies a fainter star, 12 Aquilae, and M11 is located just over 2 degrees west of the star. The best time of year to observe the cluster is from June to September, when it rises high in the night sky.